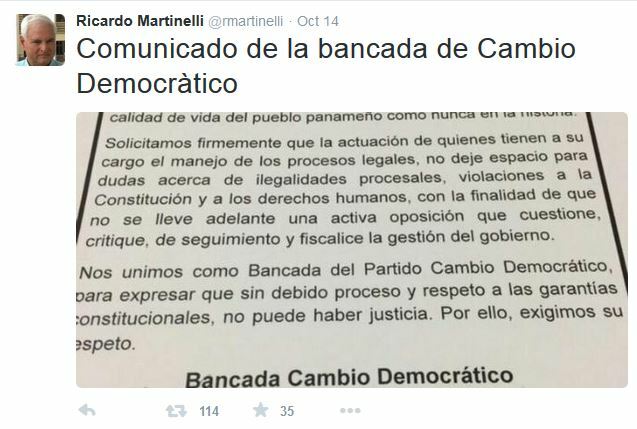 So Ricardo Martinelli shows his support in Panama by tweeting a copy of an ad in a newspaper he owns, said to be a statement by the Cambio Democratico caucus in the legislature. But the CD deputies, most of whom now ignore Martinelli, never actually met to issue this statement. He still has some newspapers, radio stations, websites, NexTV and his Twitter account in his media empire. That gives Ricardo Martinelli room to spin. As in, putting out the call for an October 14 demonstration in front of the Public Ministry. 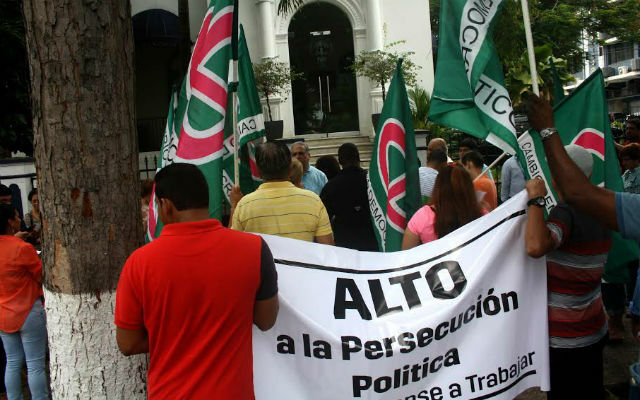 Few party leaders or elected officials of Martinelli’s Cambio Democratico party showed up, but they did hire or otherwise moblize a couple of dozen people to hold the signs and banners objecting to alleged persecution of Martinelli and a number of officials of his former administration. About 15 Panameñista counter-protesters showed up across the street, with signs of the “lock him up” genre and a small squad of riot cops moved in between the two groups, just in case. There were insults but no objects hurled and nobody was punched or arrested. But the way that Martinelli played it, the scene was a throwback to Noriega’s Doberman riot squad and CODEPADI goon beating on brave pro-democracy demonstrators. It’s not a show that moves the masses, but it’s one of the few moves left in the former president’s playbook. The world is closing in on Ricardo Martinelli. Even if for whatever reason Washington lets him stay indefinitely or permanently in the United States, the Martinelli brand is toxic here. It’s likely that by this time next month there will be an international arrest warrant out for the illegal electronic surveillance that Martinelli ordered, and that would be but one of many legal troubles. With prosecuting magistrate Harry Díaz asking for a trial before the Supreme Court and a 21-year prison sentence, magistrate Jerónimo Mejía has about two weeks to rule on that motion. But Martinelli’s lawyers moved down another avenue to delay the case, by trying to get Díaz removed as prosecuting magistrate. The full court immediately heard that motion and unanimously rejected it. There is talk that to avoid this high court trial and reset the calendar on the spying case, Martinelli will resign from the Central American Parliament, thus devolving the Supreme Court’s jurisdiction over him and sending this and a dozen other cases to ordinary courts and prosecutors. Meanwhile, the gears of Italian criminal justice grind against Martinelli, who has recently retained an Italian criminal defense lawyer to handle those cases. All of Panama’s corporate mainstream media that Martinelli does not own are in a frenzied competition to discover and report new details of how the former president and his two sons became silent partners in the hydroelectric dam business and used the government to feather their nests. The cast of characters overlaps with those of other matters under criminal investigation and the money trails from various scandals are merging and diverging here, as is common in a racketeering conspiracy case. But Martinelli isn’t denying any of the specific allegations anymore — he’s just attacking La Prensa and the Motta family that controls TVN in general derogatory terms. So where is Martinelli? By most credible accounts he’s in Miami. The ones that had him in Paraguay — coming from a single convicted money launderer and notoriously unreliable source — may have been disinformation for which the former president paid. In any case, now the man’s talking about moving to Spain or Puerto Rico. There is also talk of him formally applying for refugee status in the USA, which even if the Obama administration opposes that could start years of litigation in the US courts to delay any deportation or expulsion. About one-quarter of those who were Cambio Democratico members at the time of the 2014 elections have quit the party and now a majority of CD deputies ignore what Martinelli has to say. He is, however, still leader of that party and as such retains some useful to him immunities from investigation and prosecution that can be lifted but only after time-consuming proceedings before the Electoral Tribunal. The party has internal elections set for October 25, but moves are afoot to move that voting back to next January. Why? Because that would extend Martinelli’s extra-special election season immunity as party boss. Because the US government has not stated a position on Martinelli’s legal woes or the desirability of his presence in the United States, we can’t tell with much certainty the probability of Ricardo Martinelli taking up residence in a concrete and steel cage. But it looks possible enough and imminent enough to him that he’s visibly squirming.